It's been WAY too long since I've had the opportunity to post here on the blog, but I guess that's to be expected during wedding season! I have had the chance to work on a few new designs though, and hope to share them here in the next week or so. 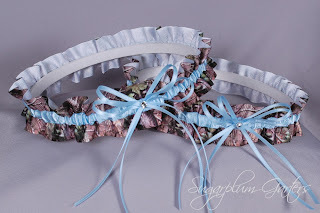 First up is this fun "Something Blue" wedding garter set perfect for the bride marrying a hunting enthusiast! The pale blue ribbon fills the "something blue" of the "something old, something new" wedding tradition and the Realtree camouflage is sure to bring a smile to the face of a groom who loves to hunt! The set is available for purchase here in my shop; the keepsake garter in the set may be purchased separately.